It had been nearly 13 years since Cecil’s brother Aubrey – my grandfather – had died suddenly at Southfield. His five children, Valdie, Renford, Clinton, Ciseline and the youngest Colin, were all in Jamaica. The Hodgson boys didn’t want to ‘work the dirt’ they didn’t want be farmers. Now that Cecil was lodging at his friends large house in Langley, there was room to bring his nephew over from Jamaica. On the 17th March 1954, Aubrey’s eldest child, Valdie flew Pan Am from Kingston Airport, Jamaica to Idlewild Airport, New York. (This was later to be J.F.K Airport) His fare was paid by his Uncle Cecil. On arrival at New York the same day, Valdie then boarded his ship, Groote Beer. His ship arrived at the port of Southampton, England in the March of 1954. After disembarking the ship, he headed out to the Midlands. Once settled in the lodgings at Bloxcidge Street, Langley, he quickly found work at nearby Tube Products. Valdie would later join the factory cricket team. His Uncle Cecil, worked just opposite at Albion Bottle. They both worked the late shift 2-10pm. This Building Was Formerly Tube Products. At The Crest Of The Hill Was Albion Bottle. My 20-year-old dad Renford – known as Rennie – was living at Southfield Pen with his grandfather, Mass Teddy and cousins. He was quite inquisitive and would often speak to his grandfather, asking questions him about the family. Mass Teddy told him many things, a lot of which he has recounted to me over the years. With his eldest brother Valdie, now settled in England, dad wrote to him nearly every week, asking when he could pay his fare to England. He was constantly writing and became very frustrated with the long wait, wondering why was it taking such a long time. Cecil had lived through five years of war rationing, but Valdie had caught just the tail end of it in England. He was only getting about £6 a week at Tube Products, but it was going to cost £85 fare for my dad to fly to England. This was a large sum of money for Valdie to try to find. It took a long time for him to save this money, but after more than a year, Valdie eventually sent the money on to my dad in Jamaica. It was planned to pay this money back to his brother, when he found work. 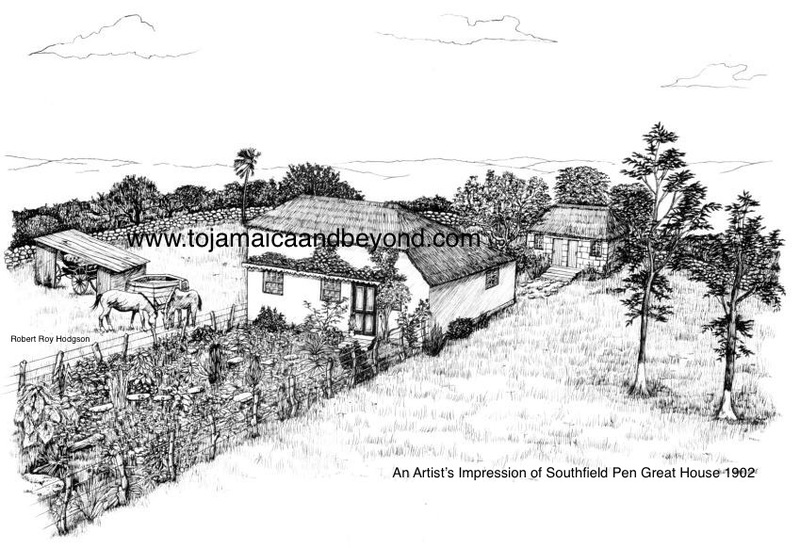 Dad then left Southfield Pen to go to the Capital, Kingston. He would never see his elderly grandfather Mass Teddy ever again. Dad and Valdie’s mother, Goldie Mae Deer – Miss Gold – had married and lived with her children and husband, Lezlie Leyton Collins at 34 Maxfield Avenue, Kingston, Saint Andrew. Dad arrived at his mother and stepfather’s home on Sunday night, the 6th of July 1955. The next day Monday, his stepfather, affectionately known as ‘Daddy Barber’ gave him a smart haircut, after which he went immediately to have his passport photo taken. The same day, he gained his Jamaican passport from the Emigration Department in Kingston. He was excited to fly and loved it when the plane first took off. In no time at all the plane was high up above the clouds. Dad excitedly remarked “We am above the sky!” He was thrilled. Aircraft flew more slowly back then in the 50’s, only about 200 miles per hour and planes needed to land several times mid journey for refueling. From Kingston, it’s destination was to make stops at Nassau, Newfoundland, Canada and Shannon Airport, Ireland before arriving in England. It flew for two hours to Nassau, then 9 hours to Newfoundland, the passengers getting off the plane at each airport. It didn’t go to Shannon Airport because of bad weather, but instead landed at Dublin, Ireland. Dad was now in Great Britain. Here the Jamaican passengers got off and went into the terminal. They were surrounded by security guards, who kept an eye on them, checking their movements. With 3-4 passengers around a table, dad had his first British experience, sipping tea from an enamel tea caddy. He enjoyed that very much. After a long an exhausting travel time of about 19 hours, with many stop overs, dad finally arrived on English soil at London Airport (later to be known as Heathrow Airport) He landed there at 6am on Wednesday 9th July 1955. He saw lots of chimneys billowing out smoke and didn’t like what he saw. It made him sad. From London Airport he made his way on the tube to Euston Station, where he caught a train to Snow Hill Station, Birmingham. Hiring a black cab in Birmingham, he shared the taxi with a girl whose company he enjoyed. They were to share the fare. She got out at Smethwick, they said goodbye, then the black cab continued on it’s short journey to Bloxcidge Street, Langley, where he paid the majority share of the £5 fare. Cecil and Valdie came back from their shifts just after 10pm. Dad was awake and heard people talking downstairs. He heard his Uncle say to someone “My nephew Rennie was supposed to have come from Jamaica today, have you seen him? “Yes he is in bed upstairs” came the reply. That was when they first saw him. The following day, thursday, someone took dad to the labour exchange opposite Broadwell Road, Oldbury. Four days later on the Monday, he started working at Tube Products on the day shift 8-5pm. He had to work a week in hand before he could start receiving his weekly wage of £5 10 shillings. His first experience of Tube Products was not good. He didn’t like the place. It was very noisy, and very big. The workers were treated like slaves. If he wanted to use the toilet, he would have to tell the chargehand first. If someone was gone for more than 5 minutes, the chargehand would come looking for them, telling them to get back to work. Dad would later join their cricket team. “Apart from my research and collection of documents, most of the information in this blog was recounted to me by my dad. Some of it was recorded by me many years ago, but I also gathered lot’s of new information from him just yesterday. This is why the blog is two day late. My dad’s memory of events is quite remarkable, he really brought this story to life. The way he told the stories to me two days ago, it felt like I was there and it was happening live. Cecil was the pioneer of the Hodgson family in England, but had it not been for my Uncle Valdie, if he had not paid my dad’s fare to England, It is doubtful that I would be here today. Although the wages paid to foreigners was very low, it gave them their independence, and a foundation to build up their lives. It has been so amazing to learn about the Hodgson’s travels and how the family helped each other to settle on the other side of the world. I hope you have enjoyed reading ‘1954/55 – Nephews Arrive’ Robert Roy Hodgson. You’re so lucky that your dad has a good memory (and likes talking!) My dad did, too – I’ve audio tapes of his memoirs – but he didn’t want to share his memories with anyone other than me and my sister and it took me ages to get him to commit to let me tape him. That £85 was a heck of price to pay in those days! While from a different part of the world, the elders of my family were also immigrants who had to find the money for them to come here. Thank you for your comment Val. Yes my dad remembers so much and just loves to talk about it. Wow that’s amazing that you have recordings of your dad’s stories. Not many people have that luxury, I would be so intrigued to get it all written out! How long have you been doing your family research, Robert? Sorry for the long delay in replying to you Val, it was due to heavy work commitments. Thanks for your message, I have been studying my family history since 1999 and enjoy it very much. I research and write everyday and have done so eversinc I first started. Have you ever researched your family? Everyday, wow, that’s commitment! Yes, I did my family tree (both parents’ sides) some years ago and got as far as I wanted to go and then passed them on to other relatives. I’m hoping when they become of an age to be interested (they’re not yet) that their children will take it up where I left off. I was always more interested in the family stories than trying to get it far back, so I often got carried away on the anecdotes! Yes I even researched and wrote articles while I was away on holiday, how sad is that!